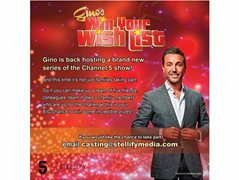 Gino is back hosting a brand new series of 'Gino's Win Your Wish List' - and this time it's not just families taking part. So if you can make up a team of five friends, colleagues, team mates or family members who are up for the challenge; this is your BIG chance to win some incredible prizes! Exciting Audition Opportunity for Young Performers from All Over the UK!